Colombia is a rich territory, with one of the most extensive biodiversity’s on the planet, extreme variation in climate and topography, multiple cultural expressions and economic contradictions. Colombia is the second most biodiverse country in the world. Multicolored butterflies are yellow, green, red, orange, violet they fly high and carry the message that in Colombia, life is sacred. A diversity of mountain climates allows swimming in crystal clear waters, hiking to the top of a tropical snow peak, wandering through the Amazon or contemplating the Pacific Ocean. Communities inhabit its territories; many contradictions exist within the millennium. Exact sciences confronted with pulsating myths. Past cultures merge with the present, uncertain and possible at the same time. The people inhabit Colombia’s territories with the contradictions of the new millennium. Myths and exact sciences are locked in a perpetual confrontation. Ancient cultures merge with the present defining a future of multiple realities that are open and uncertain. Colombia is a country of strong economic contrasts. The rural and the city, poverty and wealth are threads that draw a scenario of unsolved contradictions. Between one reality and another exists a distance difficult to reduce. Colombia’s new history is built by an emerging generation with a desire to define their own destiny, recognizing the countries potential and its possibilities. 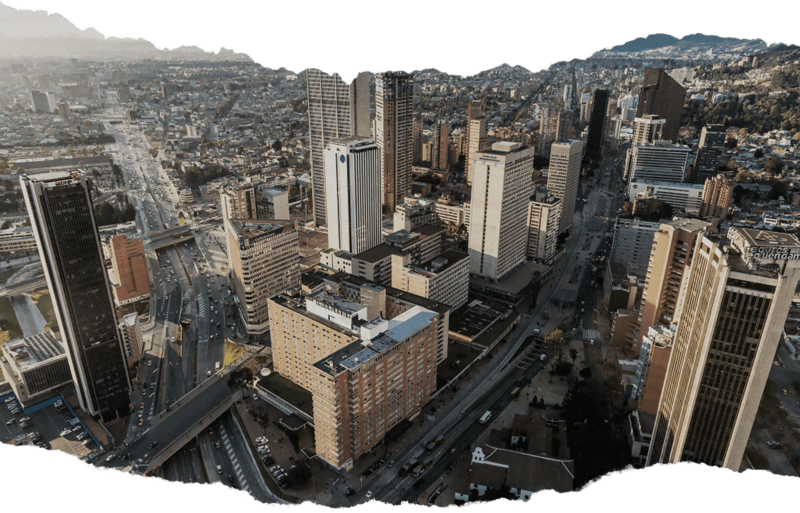 A powerful mountain range orientates the people of Bogota, on urban maps the North of the city appears on the left. The city’s climate has multiple personalities, four seasons can be experienced in one day. Bogota’s only controllable aspect is indetermination. An uncertain stability. A constant instability, while its inhabitants prevail with creativity and resilience. Bogota takes your breath away, located at 2,640 meters (8661 feet) above sea level, the main protagonist is the lack of oxygen, the body feels its weight, a feeling like nowhere else. People in Bogota are doing everything imaginable (“hay gente pa’to”). People at the corner, on the bus, in the bakery, at the hairdresser, on the street, in the office, at home. A frenetic city that never sleeps, with8,080,000 people representing 16% of the country’s population. Bogotá welcomes everyone, from all corners of the country or other parts of the world. 10 million tourists visited in 2017 of those 8 million were national and 2 million internationals. Bogotá’s light is special, the sun is closer to the surface of the earth and burns the horizon creating beautiful sunsets. Bogotá is chaotic, informal, noisy and dysfunctional with diffuse city limits. Everything is under construction, in process and growing. A big metropolis intertwining multiple, diverse and contradictory realities. Bogotá is chaotic, informal, noisy and dysfunctional, with a diffuse border. Everything is under construction, in process, growing. A big metropolis intertwining multiple, diverse and contradictory realities.